Getting ready for the trip, pre-packing, sorting things out, listening to some music. Can I just say that the first two movements of Bartok’s Concerto for Orchestra are the most extravagant, wonderful things ever? It was hard to explain to the postman that I’m not sad, they’re Bartok tears, so I claimed allergies. I especially like the 2nd and 4th movements. In fact, I often play the 4th mvmt. theme on my cello when noodling around. 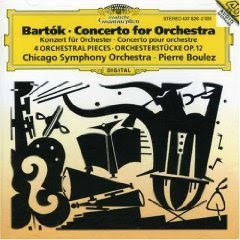 If you like Concerto for Orchestra, you’ve also got to like Bartók’s Music for Strings, Percussion and Celesta. I’m partial to the 1st and 3rd movements of this one. For some reason the 4th movement of this piece reminds me of Lenny Bernstein. It was written when Bernstein was 18 years old. Wonder if it influenced him? I don’t know Bartok’s music, but I can sympathize with the packing. I’m heading out on my road trip to FL and not only do I have to pack, I have to make sure that I leave my apartment as clean as possible. Does everyone do that? It only makes me more exhausted than I should be! p.s. have fun on your trip. Yes, you can say that. I especially love the Montreal Symphony recording.